A busy week wrapped up with a fresh book review and the Friday link collage! Development news: Why do expats earn more than locals? Southern online workers (also) get a rough deal; advice on development career starts; Niger Delta suffocating in oil; how dangerous was Zika? More on chickens & cash; Comic Relief needs to become political; gendered leadership gap; the irony of accessing the humanitarian ICT forum remotely; burnout in the field. Academia: Female sessional instructors’ heavy gender toll; Elsevier & Dutch open access; can universities have local and global engagement? I bought Dean Karlan and Jacob Appel’s book Failing in the field: What we can learn when field research goes wrong as a potential addition to our Research Methods course reading list. And while the short and very well written text provides some practical insights into how to learn from failure in development field research, the further along the book I read, the uneasier I grew about some of the underlying discourses of the book. First and foremost, the book is about randomized controlled trials (RCTs), surely the authors’ expertise, and at no point in the book is the view on field research broadened. Today, conversations about poverty alleviation and development are much more focused on evidence than they were before-a shift due, in large part, to the radical drop in the price of data and the growth of randomized controlled trials (RCTs) (p.2). Long week, but lots to read for you over the weekend ;)! Development news:US peacekeeping cuts; celebrities helping Somalia; celebrities (different ones…) romanticizing poverty; localizing aid in Syria; gold mine misery in Liberia; India’s suicides; where did the HONY money go in Pakistan? ICT4D in Nepal; teachers, refugees and mobile phones; talking back to Gates. Our digital lives:Karen Attiah and diversity; romanticizing the gig economy. Publications:Besieged universities in Egypt, aid data graveyards (and how to avoid them…). Academia:Time-sucking job applications; breaking the shackles of medical journal publishing. Nicolson’s book is a short new book that addresses one of the favorite academic products researchers love to hate. 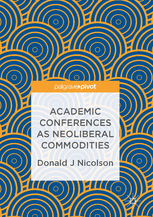 Donald J. Nicolson’s Academic Conferences as Neoliberal Commodities is a short new book that addresses one of the favorite academic products researchers love to hate. Nicolson’s book offers a fresh and concise overview over the topic based on his own experiences primarily in the field of health science and additional interviews with a sample of academics from different disciplines. His “exploratory examination” (p.8) is structured along a fictitious conference proceedings table of content and in many ways he does take us on a journey to explore gatherings of academics in the neoliberal age. He starts with a short historical exploration into conferences and, at least for me, with a reminder that there really was a time when they fulfilled the expectation of “intellectual communication (and) to enable people to present and discuss findings from research” (p.5). I'll keep it short and simple as I'm more than ready to leave the office this Friday afternoon...enjoy your readings! Development news: Humanitarian Dating; breaking the hunger cycle in Bangladesh; the limits of digital disaster response; stop giving ‘voice to voiceless’! ; also stop ‘raising awareness’! ; World Bank & behavior change; UNDP & innovation; ODI & influencing high-level panels; the WDR is great! ; better peacebuilding; the end of aid’s golden age; Nepal shuns returning experts; the limits of hip-hop for social change. Our digital lives:‘Fearless Girl’ is fake corporate feminism; gender quotas push out mediocre men; #allmalepanels are bad; digital surveillance of women in Colombia. Publication:Labor migration and remittances in Nepal. Academia:What if sociologists influenced policy?